The Norbertine Community of St. Norbert Abbey has elected the Rt. Rev. Dane Radecki ’72 as the seventh abbot in its 125-year history. Abbot Radecki was elected for a term of nine years and begins his term immediately. The new abbot is a graduate of Prémontré High School (now Notre Dame Academy in Green Bay) and St. Norbert College. His theological training took place at Catholic Theological Union, Chicago, from where he received a Master of Divinity degree. He received a Master of Science in Administration degree from the University of Notre Dame and a Doctor of Education degree from the University of San Francisco. He was ordained to the priesthood in 1977. Following his ordination, Radecki served on the faculty and as principal of Prémontré High School. In 1990 he was named the first principal of Notre Dame Academy (NDA), and in 1993 was appointed president of the school. Radecki joined SNC in 1999 as assistant to the president of the college for mission and heritage, and in 2001 was appointed vice president of mission and heritage and pastor of St. Norbert College Parish. 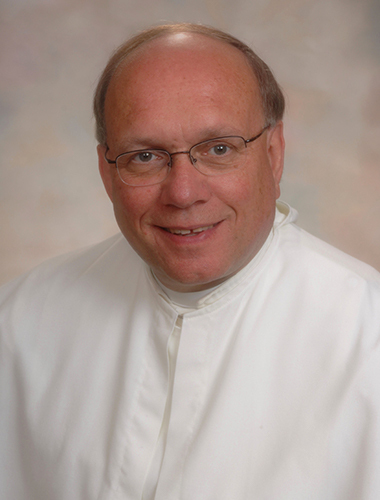 Radecki returned to NDA in 2005 serving as president, and in 2010 was appointed pastor of St. Agnes Parish, Green Bay. In 2012, Radecki was named president of the Green Bay Area Catholic Education system (GRACE). In 2016 he was named temporary administrator of St. Mary of the Immaculate Conception Parish, Greenville, Wis., and most recently served as pastor of Holy Cross Parish Family, Green Bay. Radecki has served on boards of trustees at SNC, NDA and Archmere Academy, Claymont, Del. He was a planning consultant in the office of Catholic education for the Archdiocese of Chicago; administrative intern for the office of the president at the University of St. Thomas; and president of the Wisconsin Association of Principals of Catholic Secondary Schools. In preparation for the abbatial blessing, a coat of arms is being developed by the new abbot. At the formal blessing, most likely in June, Radecki receives his miter and crozier – symbols of authority and service. Radecki now heads a community of 53 priests, brothers and seminarians attached to an abbey whose members can be found in houses in De Pere, Chicago and Raymond, Miss. The Norbertines of St. Norbert Abbey sponsor St. Norbert College; Notre Dame de la Baie Academy, Green Bay; the Norbertine Volunteer Community and the Norbertine Center for Spirituality. The Norbertine community also staffs several parishes in the Diocese of Green Bay, including St. Norbert College Parish; Our Lady of Lourdes Parish, De Pere; St. Willebrord Parish, Green Bay; and Holy Cross Parish Family. Sacramental assistance is also given to other parishes, hospitals and nursing homes in the diocese. Abbot Radecki, the son of Richard Radecki and Theresa (Villeneuve) Radecki, is a native of Pulaski, Wis., where his family continues to reside. He has one sister, Lori Hudson (Roger), and two brothers, Rodney Radecki (Cheryl) and the late Jeffrey Radecki. 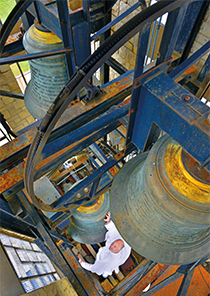 The abbey bells ring to announce the completion of the election process whenever a new abbot is elected. With the exception of the founding abbot himself, all the abbots of St. Norbert Abbey have graduated from St. Norbert College.